Although lizards might not wear their emotions on their sleeves like dogs do, a lot of people manage to enjoy rewarding rapports with the reptiles in their lives. If you own a bearded dragon from the genus Pogona, you might find that your little guy has a loving side. Bearded dragons that live in their natural habitats often are alone for their bulk of their lives. Unlike many mammals, they can handle being by themselves all the time -- and even appreciate it. Bearded dragons are totally different than dogs, for example, who even out in the wild always share the company of their pack members. Although bearded dragons as lizards might not naturally be the most affectionate of animals, with a little time they often get used to the people who are around them every day. 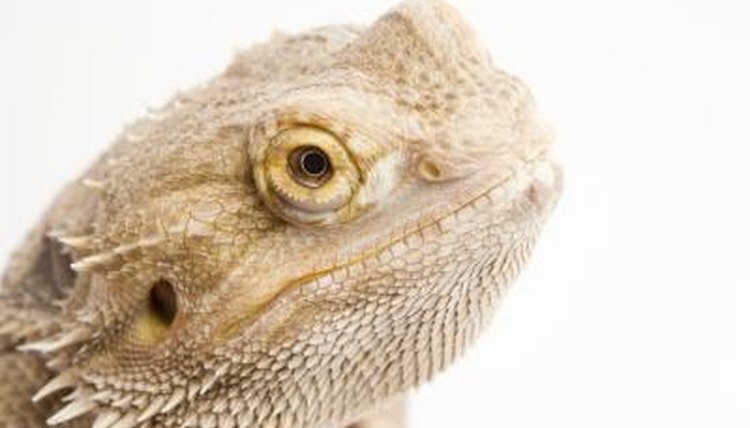 If a person becomes part of a bearded dragon's daily routine, the lizard might start looking forward to her presence. They occasionally go up to their owners of their own volition, seeking a little attention. It isn't unheard of for bearded dragons to behave affectionately and sweetly around their closest people. For the most part, bearded dragons possess markedly relaxed and tame dispositions. It doesn't usually take too long for them to adapt to being around people. Bearded dragons are individuals, with distinctive "personalities." Some bearded dragons seem neutral when their owners pet and cuddle them; others appear to be having a ball. Some bearded dragons like to relax and lounge on their owners' laps while they're getting a little weekend reading done. Some bearded dragons respond positively to being picked up. Fully grown bearded dragons tend to be especially accepting of physical contact with people. The youngsters are usually a lot more jittery and nervous. If you wish to snuggle your bearded dragon by holding him, make sure you do so in the correct manner. Put your hand under his belly, then carefully lift up his body. Once your adorable lizard relaxes in your hand, softly cradle his stomach. Avoid holding your bearded dragon by his tail, and make sure you provide his body with sturdy support. How Often Should You Hold a Hamster? Does a Guinea Pig Make a Good Pet? Do Guinea Pigs Need Human Attention?